Los Angeles County Sheriff’s Department Homicide Bureau Detectives are continuing the investigation into the shooting death of a Female Asian adult. The incident occurred on Friday October 5, 2018 at approximately 3:38 p.m., on the 900 block of East Joel Street, Carson. 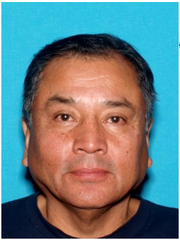 Detectives have learned that the victim’s husband (Benjamin Ramirez, 68 years old) was seen at the location near the time the crime occurred. The victim’s husband was last seen driving away from the location in a 2010 silver Honda Accord 4 door, license plate 6NIE524, which is registered to him. Mr. Ramirez is sought as a person of interest at this time. Los Angeles County Homicide Detectives are investigating the shooting death of a female Asian adult that occurred on the 900 block of East Joel Street in the city of Carson. On October 5, 2018 at approximately 3:38 p.m. Deputies assigned to Carson Station responded to the location regarding a person down call. Upon their arrival to the location, they located the victim who had sustained at least one gunshot wound to the upper torso. The motive for the crime is unknown and the investigation is still ongoing. Los Angeles County Sheriff's Homicide Detectives are responding to investigate the shooting death of a woman. The incident occurred on Friday, October 5, 2018, at approximately 3:39 p.m., on the 900 block of East Joel Street, Carson.